Features: 6.5" LTPS IPS LCD display, Hisilicon Kirin 710 chipset, 3750 mAh battery, 128 GB storage, 6 GB RAM, Corning Gorilla Glass 3. First impression about Huawei Honor 8X is that it is an incredibly stylish-looking smartphone, despite its adoption of a notched display. Honor's focus this year has been updating design to a more modern look, and to achieve that Honor has brought artist Sei Smith and German designer Dieter Rams on board. Being wildly stylish, Huawei Honor 8X's design still looks familiar, and that's because it makes you recall Huawei Nova 3i, which has a similar design, though it has a slightly smaller display. Phone is made from 2.5D textured aurora glass over an aluminum frame. This glass back is a first for Honor's X series and is comprised of 15 layers of glass which catches light and refracts it, sending shimmering patterns across the back of phone. It's a similar effect to that on Huawei Honor 10, and it's utterly stunning, whether in black, red, or blue variants. A quarter side of glass looks a little more matte, giving off a unique two-tone look. Look and feel of this device exceeds expectations, especially when you realize this is meant to be a budget device. At front of Huawei Honor 8X, there's a large notched display with minimal side bezels and a very tiny bottom chin. It's impressive how thin this bottom bezel is as even a lot of flagship devices come with a thicker bottom bezel. Notch is where front selfie camera, earpiece and sensors reside as expected. Moving towards back, there's that beautiful glass back that shimmers and really makes you want to show off this phone. There's a dual camera setup on top left of device with a flash right below together with AI camera branding. Fingerprint scanner is at top middle and is surrounded by a metal rim for tactile feel. 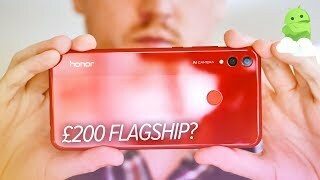 There's some Honor branding on bottom left of phone with the rest of back kept clean in its glorious beauty. At right side of device, you'll get a power button with volume keys while left side is kept clean, just like top. At bottom, there's a bottom firing speaker grille and a Micro USB port which is disappointing, but I was uplifted to see a 3.5mm headphone jack. Overall, it's not a new design, rather a signature Honor design, but it's great to see this premium design and built on a budget device. 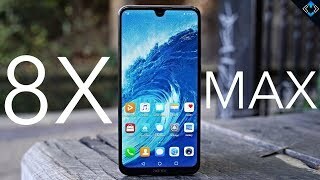 It's moves like these that push other manufacturers to make better built and better looking budget phones and Huawei has done their customers just about right with Huawei Honor 8X's design. 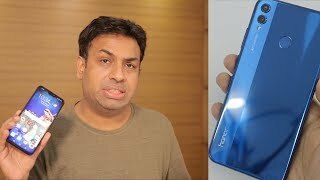 Huawei Honor 8X is a budget device and display is where company has made the cut to keep cost low. There's a huge 6.5-inch LCD display with resolution of 2340x1080p, aspect ratio of 19.5:9 and pixel density of 396ppi. That's impressive, especially in budget arena, and means that handset is the size of a traditional 5.5 inch smartphone. Ideal for anyone who wants a big screen but not necessarily big pockets. Honor has managed to slim down bottom chin by bending display into frame at bottom of phone, a similar process that took out bottom bezel on Apple iPhone X. Honor is calling this design "FullView Display 2.0," and it claims that Huawei Honor 8X sports a huge 91 percent screen-to-body ratio, one of the highest I've ever seen on a smartphone. As you'd expect, screen looks bright and beautiful, and will more than satisfy your HD Netflix needs. However, I managed to put a scratch in within just a few days, as display on this phone isn't protected with Gorilla Glass 5. It's also the first smartphone screen to be certified as having excellent blue-light filtering by TÜV Rheinland. Blue light is suspected to keep you awake at night, and while some of the claims that it causes blindness are unproven, it's still something that many people are interested in cutting down on. Display will also incorporate technologies for use in both sunlight and night and it will make Huawei Honor 8X's screen easier to see outside during day while also helping you read from this screen at night more comfortably. It's a good display and even with a low pixel density, it still makes using this phone a pleasant experience. Huawei Honor 8X is a budget device and I wasn't expecting top level hardware specs on it. However, specs on this phone turn out to be quite close to Huawei Honor Play, but there are some tweaks and improvements that may make Huawei Honor 8X more compelling for bargain hunters. Phone is powered by Huawei's own Kirin 710 and Mali-G51 MP4 GPU with either 6 GB or 4 GB of RAM and 64 GB or 128 GB of on-board storage. Phone also supports external memory expansion with up to 400 GB of extra storage. Octa-core Kirin 710 chipset inside Huawei Honor 8X is same chip that's in Huawei Mate 20 Lite. This processor packs four Cortex A73 cores, same high-power cores you'll find in powerful Kirin 970 from Huawei P20 Pro, while other four are lower power A53 cores that handle smaller tasks to save power. Honor said that Kirin 710 will pack 75 percent better performance on a single-core, and 68 percent better on multi-core performance. Huawei's GPU Turbo mode is onboard too, which should boost gaming performance hugely. NFC is included, but it's currently unknown whether or not this feature will be making its way to global models of Huawei Honor 8X. On benchmark test, phone got a score of 139,871 on AnTuTu which is fairly lower than Xiaomi Mi A2's score of 140,451 which runs on Snapdragon 660 processor. Another downside to this phone is its lack of USB Type-C, as you'll get a Micro-USB port for charging. A positive to take from here is a 3.5mm headphone jack but bottom firing speaker isn't that good, it's decent at best. Network Technology for Huawei Honor 8X is GSM, HSPA, and LTE, which shows that this device can handle 4G internet connection fairly well. Overall hardware experience on Huawei Honor 8X is mildly satisfying and similar to the one on Huawei Nova 3i. Budget smartphone users will be fairly happy with this device and won't be having anything against this hardware performance. Huawei Honor 8X comes with an enormous 3,750mAh battery inside and with four energy-sipping cores inside Kirin 710, it can probably be expected that this device will make the most of this hefty amount of power. Unfortunately, there's no fast charging on this device, and a MicroUSB port. During my battery test, I played a couple of graphic intensive games and some videos and phone gave me a solid 6 hours of screen-on time. Without fast charging, however, Huawei Honor 8X takes a whopping 2 hours and 24 minutes to charge phone to 100 percent, which in my opinion can get frustrating in case you're in a hurry and won't be near a power outlet anytime soon. Again, this is a budget device and for that, a lot of people won't have much complaints about Huawei Honor 8X's battery life and performance. Most budget phones falter at camera department as this is the most apparent area to make a price cut. Huawei Honor 8X seems different, however. You'll find a dual-lens camera set-up on back of phone comprising of a 20 MP main camera having an f/1.8 aperture lens paired with a secondary 2 MP, and single 18 MP selfie camera having f/2.0 at front. Rear-facing camera suite is lens that's used for depth-sensing and "bokeh" background blur. Huawei Honor 8X's camera also benefits from A.I. boosted capabilities. Like many of Huawei, Huawei Honor 8X will be able to recognize various categories of scene and apply tweaked settings to match shot being taken. Phones is able to recognize 500 scenarios in 22 different categories and will even be able to recognize multiple scenes in a photo. While eating food, AI is able to distinguish between sushi or ice cream. Even animals like cats and dogs are detected reliably and underlaid with appropriate filter. AI will also work to keep your image stable, thanks to AI image stabilization (AIS) that also features heavily in phone's Night Mode, a feature ported from Huawei P20 Pro. It also has a night mode, which combines multiple exposure shots into one image. There does seem to be some noise tradeoff, but images are slightly clearer, with a little more detail compared to the standard photo mode. AI isn't just a marketing ploy here, it's actually a useful addition to camera app. It essentially works out what you're taking pictures of and optimizes settings for that, plants come out greener, cats look furrier, and phone does a lot of background calculations to optimize each element in photo. App correctly determined what was being aimed at in my tests, and final snaps came out well if not remarkable. Phone does seem to struggle a little in overcast weather, with some of my samples coming out darker and greyer than they should have been. Huawei Honor 8X is capable of shooting videos up to 1080p at 30 fps, however, autofocus on this phone is very sluggish. It's not just a great phone for shutterbugs either, Huawei Honor 8X will have support for taking slow motion videos of up to 480 frames-per-second, up to a resolution of 720p. Camera app on Huawei Honor 8X itself offers numerous filters and effects and a very special time lapse mode. Camera software also makes front camera selfies mask a beauty filter and though it might appeal some, it is definitely not for me as it makes images look artificial. Most users will find camera experience on Huawei Honor 8X as barely enough for everyday needs. For obvious cost reasons, Huawei didn't add a really good camera on this phone but even this setup isn't too shabby and most people will be content with it. Huawei Honor 8X ships with Android 8.1 Oreo straight out of the box with Huawei's own custom skin EMUI 8.2. Software leans visibly towards iOS, but it offers plenty of extra features and adjustments as compared to stock android. Unfortunately, animations and change between browser window is always quite slow. Memory management is also still aggressive, despite having up to 6 GB of RAM. Allegedly, built-in AI should support you in your daily usage by learning the pattern of your phone usage. So, if you take a lot of pictures, you get a lot of free memory and a permanent available camera app. If you use loads of messaging apps, there'll be WhatsApp, Messenger and Telegram available at your home screen for first glance access. However, if you behave normally, you get nothing. Incidentally, Huawei also uses AI to translate texts and identify image content in translator app. Text recognition via said Microsoft Translator is quite useful and works offline, but not live. Multitasking and switching between open browser tabs are relatively slow. Animations of windows (opening apps) look nice but slow down workflow. You can disable them only in developer settings. Respective app icons distribute EMUI on different home screen and if desired, you can then sort them into folders. Software navigations are located at bottom where they usually are. but you get the option to change them which is quite helpful. Home button with a built-in fingerprint can also be used as a kind of "touchpad" so you can control your operating system by swiping sensor. You can also trigger screenshots by tapping your knuckles on screen and Huawei's scroll-shot feature takes screenshots of content that can be several pages long. Knocking with two knuckles on display also triggers screen recording. Said video is then saves in your gallery and personally this is one of my favorite features about this device. There's also some fancy gimmicks built-in, including 'Elevator Mode' for quick reconnection to 4G when you get out of a lift, and noise/wind reduction for calls. Demos Honor showed were impressive, but how these features actually perform will depend on long usage of device. Other than that, it's same EMUI experience you get on other Huawei phones. You'll have to bring back app drawer manually if you don't want to store all your apps on home screens, and you'll need to tap icon in middle of the quick launch bar to open said drawer, because EMUI doesn't yet have vanilla Android's swipe-up functionality. You'll also be dependent on Huawei's fairly opaque schedule to get the update from Android 8.1 Oreo to the newer 9.0 Pie. It's definitely not stock, contains bloatware but also performs some quite useful features in Huawei's own unique style. 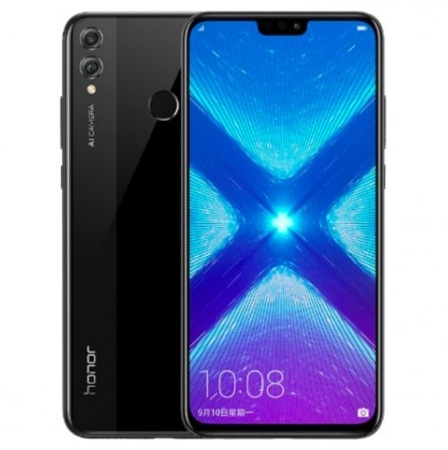 Huawei Honor 8X went on sale in China on September 5 for 1,399 Chinese Yuan, and it will come to a global market on October 2, with prices starting from 999 AED (around $280/235 Euros). It will likely land in the U.S. later this year or early 2019. Phone is available in four different colors: Black, Blue, Red and Pink. The amount you get in a sub-£250 phone these days is genuinely mind-bending, and Honor continues that trend with Huawei Honor 8X. Specs are great, camera and screen are both strong, and I have high hopes for overall experience in everything except divisive software overlay. If you can deal with some bloatware, a longer wait for Android updates and a bit of tacky design, payoffs in terms of battery life, performance and good old-fashioned value for money are substantial. Dual-SIM plus microSD inclusion is another upside, making this an appealing phone for work or travel, and handset looks better than you'd expect for its cost. 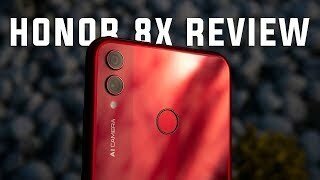 Old-style micro-USB is disappointing, and I have concerns about slipperiness vs durability of screen, but overall, I think Huawei Honor 8X is going to be a compelling addition to budget Android segment. It will definitely stand out from its competition with its giant display and exceptional design. Huawei fans won't mind the software bit of this device and will be extremely delighted to see a phone which gives such a good bang for the buck.